Retained placental tissue (RPT) occurs in approximately 1% of patient after vaginal or cesarean delivery. In Hong Kong, puerperal curettage remains to be the surgical management of choice. However, puerperal curettage is complicated by perforation in approximately 3% of women, while there is an 8.9%–30% risk of developing intrauterine adhesions. Hysteroscopic resection of retained placenta has shown to be a successful alternative in recent studies. Complete resection was achieved in over 90% of cases reported,,, which is higher than those reported for curettage. A meta-analysis on the management of retained products of conception suggested that when compared to blind curettage, hysteroscopic resection of placenta tissues reduces the uterine perforation risk to 1.2% and intrauterine adhesion rates to 4.3%. Hysteroscopic morcellation of intrauterine pathology has gained popularity worldwide and has been used instead of the diathermy loop resection due to its shorter operative time, reduces operative risks, and remains as effective. The latest randomized controlled trial, comparing hysteroscopic morcellation versus loop resection in the removal of placental tissues, found hysteroscopic morcellation to be a faster, effective, and safe alternative to hysteroscopic loop resection. It is also likely to cause less intrauterine adhesions as diathermy energy was not used with the morcellation technique. In this case report, we report two cases of hysteroscopic morcellation of RPTs which are one of the first cases reported using this technique in Hong Kong. A 31-year-old female had an emergency cesarean section performed for dichorionic diamniotic twins and placenta praevia Stage 2 after developing preeclampsia at 36 weeks. Operation was uneventful and the placenta was completely removed. At 6 weeks postpartum, she was found to have a fever of 37.7°C and persistent lochia since delivery. Transvaginal ultrasound showed a 2.87 cm × 1.86 cm × 1.89 cm heterogenic shadow suggesting of an retained products of gestation (RPOG) [Figure 1]a. The patient underwent a diagnostic hysteroscopy which confirmed the shadow as RPT [Figure 1]b. The RPT was completely excised in 30 min using the MyoSure hysteroscopic morcellation device with the aid of intravenous (IV) transamin 1 g and antibiotics [Figure 1]c and [Figure 1]d. Total blood loss during the procedure was 50 ml with total normal saline deficit of 600 ml (total in 6000 ml and total out 5400 ml). However, immediately after completion of the procedure, the patient suffered from a further 400 ml of blood loss which was controlled by syntocinon 5 IU IV and a further hemabate 250 μg intramuscularly. The procedure of this case was clearly demonstrated in the video attached. A 38-year-old female who underwent a repeat cesarean section was found to have persistent lochia after 6 weeks later. Ultrasound performed showed echogenic shadow inside measuring 2.21 cm × 1.62 cm × 2.19 cm at fundus suggestive of retained products of gestation. Examination showed an 8-week-sized uterus with mild fever. The patient underwent a diagnostic hysteroscopy confirming the findings, and the remaining tissue was removed using the MyoSure hysteroscopic morcellation device. The RPT was completely removed in 18 min with IV antibiotics and transamin given preoperatively. Postprocedure hysteroscopy confirmed complete removal with a midline of 0.68 cm on ultrasound. Total blood loss was minimal initially, but similarly, 300 ml blood loss was found after withdrawal of the hysteroscopic instruments. Total fluid deficit was 1200 ml of saline (7500 ml input and 6300 ml output). Both patients recovered well and were discharged with antibiotics and no further fever on day 2. Histology confirmed the mass was RPOG, and the patient had no further symptoms at 8-weeks postprocedure follow-up. Our two cases demonstrated the feasibility of using hysteroscopic morcellation device in the removal of postpartum RPT. Hysteroscopic visualization and removal of products under vision not only ensures more likely to achieve complete removal but also it is less likely to cause uterine perforation and intrauterine adhesions in particular when hysteroscopic morcellation is used. One of the main concerns regarding this technique is the visibility, while the patient is still bleeding vaginally. In both cases, patients were at least 6 weeks postpartum. Compared to those recently delivered, bleeding tends to be mild at 6 weeks postpartum. Hysteroscopic vision can usually be maintained with high flow of fluid in and out of the uterus and especially when IV transamin was given preoperatively. In both cases, both patients suffered from a mild blood loss immediately after the removal of hysteroscopic instruments at the end of the procedure. This was likely to be due to the uterine distension caused by the distending medium and failure of the uterus to contract well, while the uterus may still be under the postpartum condition. Hysteroscopic morcellation is associated with less instrument withdrawal frequency compared to loop diathermy; hence, excessive bleeding during the procedure is expected to be less. Despite its feasibility, majority of secondary postpartum hemorrhage due to RPT presents through either postnatal clinic or accident and emergency; surgical management is often performed as emergency outside elective working hours. During these nonelective working hours, there may be a lack of expertise to perform such procedure particularly within the public settings. Universal treatment of RPT using hysteroscopic loop diathermy or morcellation is, therefore, not totally feasible at this current stage. In our cases, both patients had a previous cesarean section with a second cesarean section performed recently and subsequently developed endometritis suggested by their persistent lochia and mild fever. Surgical management hence was necessary for both cases. 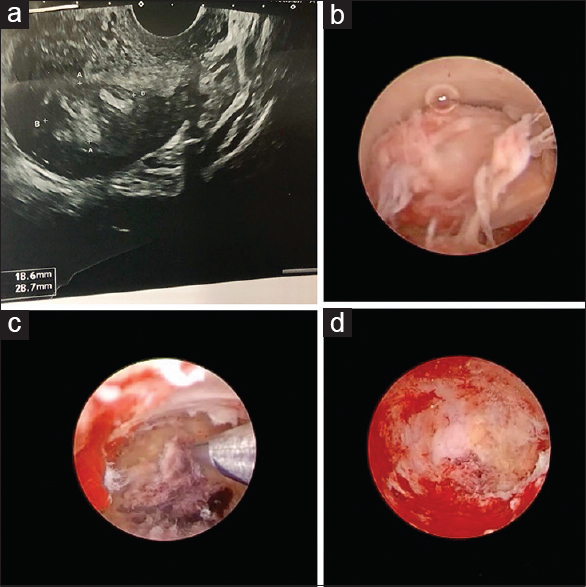 Both were at increased risk of uterine perforation if curettage was performed, and hysteroscopic morcellation was used and successfully reduced the risk of uterine perforation. Therefore, despite the difficulty to implement universal removal of RPT using hysteroscopic morcellation, this method should be considered in cases where there maybe high risk of incomplete evacuation or high risk of uterine perforation. The patient consent was obtained before the procedure. Dankert T, Vleugels M. Hysteroscopic resection of retained placental tissue: A feasibility study. Gynecol Surg 2008;5:121-4. Smorgick N, Barel O, Fuchs N, Ben-Ami I, Pansky M, Vaknin Z, et al. Hysteroscopic management of retained products of conception: Meta-analysis and literature review. Eur J Obstet Gynecol Reprod Biol 2014;173:19-22. Golan A, Dishi M, Shalev A, Keidar R, Ginath S, Sagiv R, et al. Operative hysteroscopy to remove retained products of conception: Novel treatment of an old problem. J Minim Invasive Gynecol 2011;18:100-3. Vitale SG, Sapia F, Rapisarda AM, Valenti G, Santangelo F, Rossetti D, et al. Hysteroscopic morcellation of submucous myomas: A systematic review. Biomed Res Int 2017;2017:6848250. Hamerlynck TW, van Vliet HA, Beerens AS, Weyers S, Schoot BC. Hysteroscopic morcellation versus loop resection for removal of placental remnants: A randomized trial. J Minim Invasive Gynecol 2016;23:1172-80.